Shift work has long been a reality of working in a company’s manufacturing operations. As long as there’s been a need for 24/7 manufacturing, there’s been a need for 24/7 support. But working during nonpeak hours doesn’t have to mean sacrificing work-life balance. Shift work requires non-traditional routines that can be a difficult adjustment for some colleagues. But it also offers a variety of benefits, including time off during non-peak hours that make it easier to schedule appointments, manage family obligations or enjoy your favorite activities — often without a crowd. Today, there are three rotating schedules in use at Domtar to support around-the-clock production at a number of our sites. These schedules allow us to operate as efficiently and effectively as possible, while never requiring employees to work any shift for more than a week. 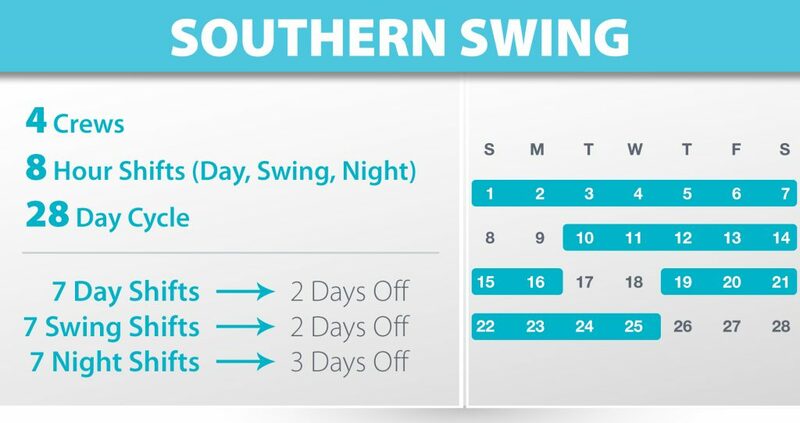 The Southern Swing schedule divides four crews across three eight-hour shifts. Each crew rotates through this sequence every 28 days: seven day shifts, two days off, seven swing shifts, two days off, seven night shifts, three days off. The DuPont schedule divides four teams across two 12-hour shifts. During a four-week cycle, each team has four night shifts, three days off, three day shifts, one day off, three night shifts, three days off, four day shifts, seven days off. 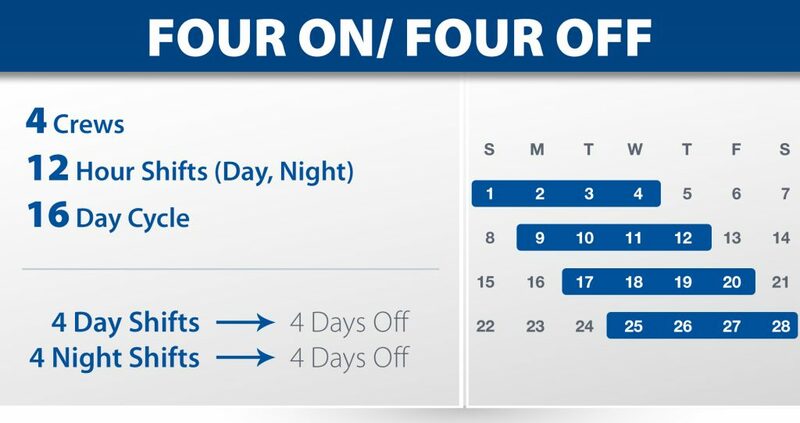 The Four On/Four Off schedule splits workers between 12-hour day and night shifts. Each group has four day shifts, four days off, four night shifts and four days off. 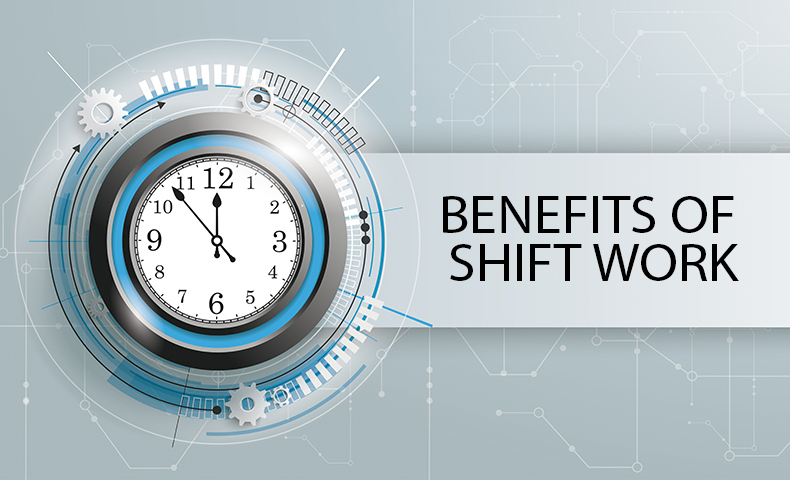 While all three schedules are widely used, the DuPont schedule is the newest model for shift work, having gained momentum in the last 15 years. The Johnsonburg Mill converted from Southern Swing to DuPont 15 years ago. For colleagues there, the change has meant fewer, though longer, working days that add up to more time off than a Southern Swing schedule. 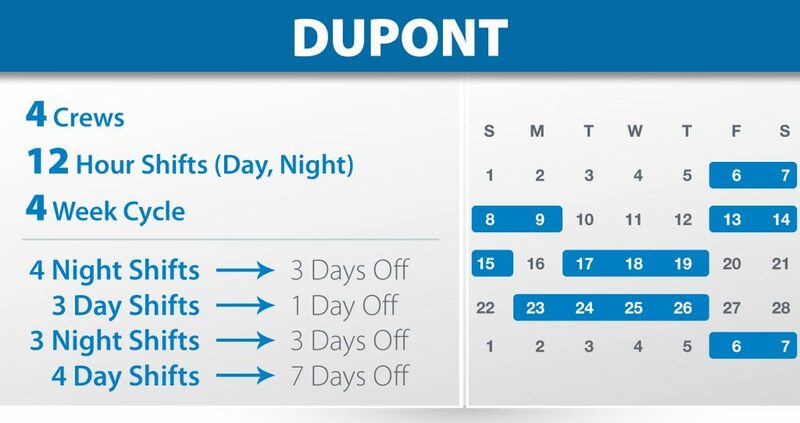 With the DuPont schedule, a typical shift is 12 hours, which equates to a 42-hour workweek. However, DuPont gives employees seven consecutive days off each month, plus another seven days in off time throughout the four-week cycle. Tammy Winker, a United Steelworkers safety advocate at the Nekoosa Mill, has been working Southern Swing since she joined the mill about 28 years ago. She says while it can be tiring and hard for your body to adjust between rotations, the combination of the extra time off and working nights helped her complete her emergency medical services training. “It allows you to plan ahead,” says Dan Goodness, a Nekoosa Mill paper machine tender. “Because it’s a standard schedule, you know exactly when your time off is coming, and you can plan a year in advance.” The tradeoff, he notes, is that sometimes the schedule requires you to work on holidays or miss certain events that might happen during the evenings or on weekends. Shift work presents a wide range of pros and cons. But as long as manufacturing operates 24 hours a day, there will be a need for around-the-clock work shifts. Through cooperation between employees and leadership, as well as adjustments as needed over time, shift work schedules can benefit both our company and our workforce.